Likaholix is an online community that gives you a easy way to discuss and share your likes, such as your favorite book, movie, music, food, brand that you can list on it. You can recommend them to friends via Facebook, Gmail, or Twitter. You can list your favorite stuff, write down your comments, and publish with some social network accounts if you have. 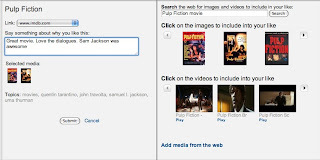 You can add related pictures and videos (that from internet like Amazon and Youtube, they are not upload from you). You can check recommendation that lists other people who like same stuff. Likaholix is a new site, still in beta version, it required invitation to register. If you like you can click this code for register.